Is China The Next United States? By Mark Fleming-Williams: Former U.S. Treasury Secretary Lawrence Summers wrote on April 5 that this month may be remembered as the moment the United States lost its role as the underwriter of the global economic system. His comments refer to the circumstances surrounding China's launch of a new venture, the Asian Infrastructure Investment Bank (AIIB). Wary of China's growing ambitions and influence, the United States had advised its allies not to join the institution, but many signed up anyway. The debacle was undoubtedly embarrassing for Washington, but even so, Summers' prophecy is a bit premature at this stage. To understand why, one must first understand the basis of the United States' dominant economic position in the world. At the height of World War II, the heavily indebted United Kingdom signed the Lend-Lease deal, which handed over British naval bases to its American cousins in exchange for financial support. This act was akin to passing the military superpower baton, since it transferred control of the world's oceans to the United States. Then, three years later, in a slightly run-down hotel in New Hampshire, delegates from each of the major Allied nations spent three weeks at the Bretton Woods Conference, where they shaped the postwar economic order. What emerged from the summit was a monetary system that was based on the U.S. dollar and two new institutions: the International Monetary Fund, which would monitor trade flows, and the World Bank, which would help provide financing for developing nations. Both were to be headquartered in Washington, and the United States effectively inherited the global economy. The U.S.-centric system functioned well for the next 25 years. The United States had emerged from the war with the world's strongest economy and, under the Marshall Plan, pumped money into the reconstruction of Europe. But in 1971, as the United States was entangled in a costly war in Vietnam, then-President Richard Nixon discovered that under the Bretton Woods system, he could pay for the war by printing more money and exporting the resulting inflation to the rest of the world. France pushed back, and a new fiat currency system that released the dollar from its explicit anchoring role was born, though it nevertheless retained its place as the dominant global currency. For the United States, its position as the spider at the center of the web has turned out to be a mixed blessing. As the heir to what former French President Valery Giscard d'Estaing called the "exorbitant privilege" of controlling the world's reserve currency, the United States has become the number one consumer, running constant deficits and amassing ever-larger debt from its position as the global supplier of dollars. 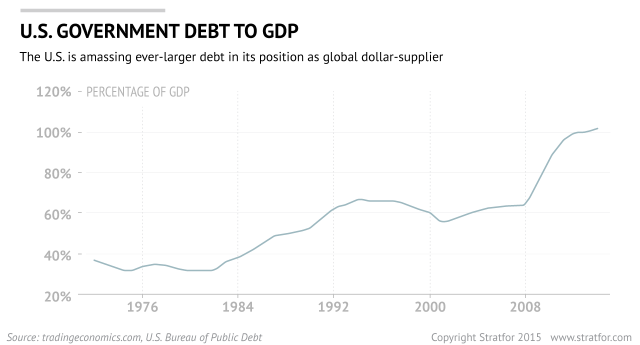 Thus, the United States and the rest of the world have been locked in a symbiotic embrace for several decades, even as America's underlying fiscal position continues to deteriorate. But looking at its fiscal position alone misses the bigger picture. Over the past few decades, the United States has retained its position at the head of the world's international monetary institutions. In 1966, a U.S. and Japanese regional version of the World Bank — the Asian Development Bank — was established and headquartered in Manila. That same year, Mao Zedong launched the Cultural Revolution, a political movement that paralyzed China and left it even less focused on international affairs than before. Despite the changes in China's global position that have since taken place, its presence in the institutions like the Asian Development Bank has not risen. (China only holds one-fifth of the combined U.S.-Japan voting share, and each of the bank's nine presidents has been Japanese.) Unsurprisingly, the bank has often been criticized for being too U.S.- and Japan-centric. China's arrival on the global scene could shake up the status quo. The growth model Beijing followed after undertaking economic reforms in 1978 was similar to those of postwar Japan and 21st-century Germany. 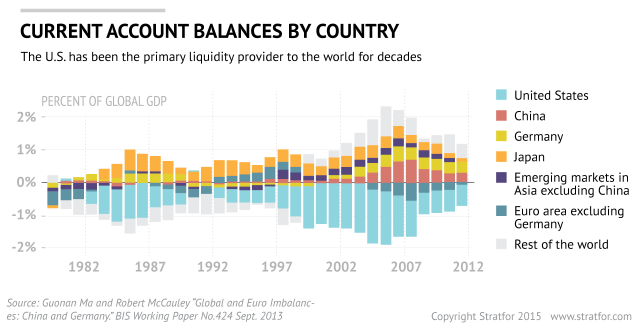 By keeping internal costs low and running a large current account surplus, China has been able to accumulate a gigantic pool of savings (about $3.8 trillion). It is now in the middle of a great rebalancing, as the country tries to shift from a savings and investment model to one of consumption — in other words, to move toward becoming the next United States. From the perspective of America's allies, China is a giant country with a huge sum of money it might need help spending and is trying to become a vast new market of consumers. The similarities of its current position to the United States' own in 1944, when it too had a giant current account surplus, are clear. Whatever the reality of China's economic trajectory over the next decade, America's allies are orienting themselves around this idea. Meanwhile, China — with its vast financial resources and plenty of regional projects upon which to spend them — found the regional institution through which it could funnel this money to be sewn up by the United States and its allies. Since the U.S. Congress has now spent five years determining whether China's voting rights in the IMF should be expanded to reflect its new economic clout, it made more sense for China to simply create its own institution rather than try and gain influence in the pre-existing Asian Development Bank. Thus the AIIB was born. This new institution, though not key to the economic futures of, say, Australia and the United Kingdom (two U.S. allies who signed on to the AIIB as founding members), nevertheless provides countries an opportunity to build a relationship with tomorrow's market giant. Each country that joined the AIIB calculated that the fraction of favor gained in Beijing through their participation was just enough justification to risk Washington's disapproval. This is indeed a significant moment, and it has been painted by some in the media as a challenge to the entire Bretton Woods system and a threat to the status quo. But these events do not represent a tectonic shift on the order of 1944. For the Bretton Woods and Lend-Lease deals to take place, and for Britain to hand over the reins, two elements had to be in place: time and a major disruption. The size of the burgeoning superpower was not enough; the U.S. economy became the largest in the world in 1870, a full 74 years before the Bretton Woods conference, but British primacy continued. It took two world wars in which Britain faced an existential threat and Winston Churchill's declaration of total war in 1940 before the country's economic security reached a low enough ebb that Britain was willing to hand over its best cards in exchange for financial relief. By contrast, the size of China's economy only surpassed that of the United States' in 2014, and it took an accounting magic trick — purchasing power parity, the adjustment of figures to reflect different relative costs in two different countries — to do so. 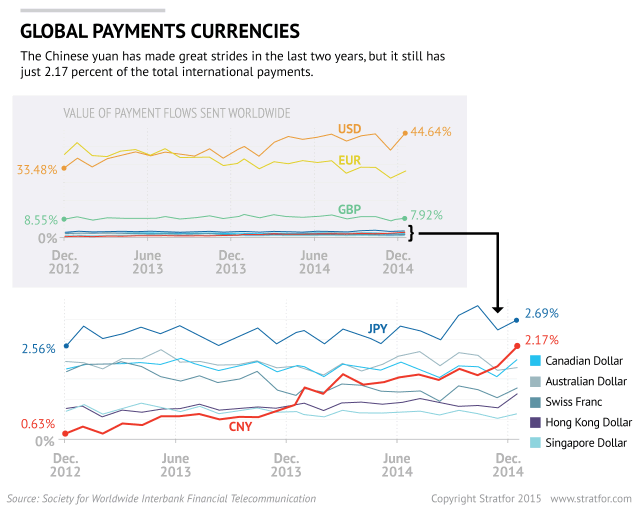 And in terms of currency, the Chinese yuan has made great strides in the past two years, streaking from the 14th- to the fifth-most used in international payments. But the yuan still only has about a 2.2 percent share of international payments; it has a long way to go before it begins to truly challenge the U.S. dollar's 44.6 percent share. Also, the Chinese currency is not fully convertible, which is a major requirement for any possible reserve currency. The final reason we have not yet seen a Bretton Woods moment between the United States and China is that we have not seen a Lend-Lease deal. The United States maintains its control of the world's sea-lanes and thus has the ultimate decision-making power over global trade. Without the onset of a massive disruption — you would know it if you saw it — this state of affairs is unlikely to change anytime soon. The vehicle that drives the rise and fall of empires rests on big wheels, and it takes a strong force applied over an extended period of time before an entire revolution can take place. The agreements struck during World War II marked the culmination of a long process in which the United States rose and Britain weakened. China has indeed undergone a remarkable transformation over the past three decades, but it is not yet in a position to effectively challenge the pillars upon which the United States' global hegemony rests. "China's New Investment Bank: A Premature Prophecy is republished with permission of Stratfor."